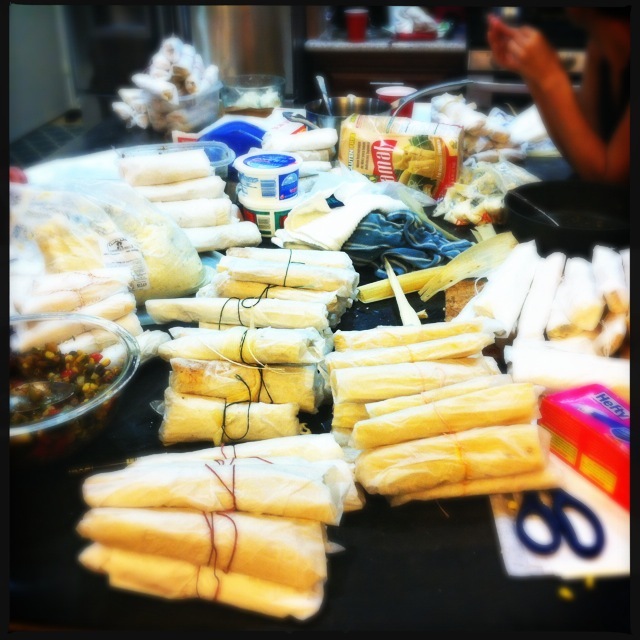 This weekend, I finally got to take part in my first tamale party. I’ve been wanting to do one of these for years and never had enough people willing to participate, and someone to let us use their kitchen, since I live in a tiny beach apartment. It was awesome! 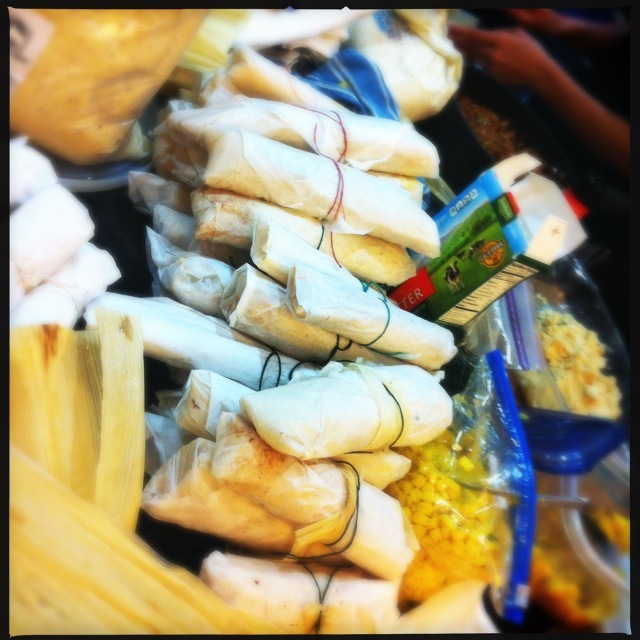 The idea behind a tamale party is twofold: First and foremost, everyone loves tamales. 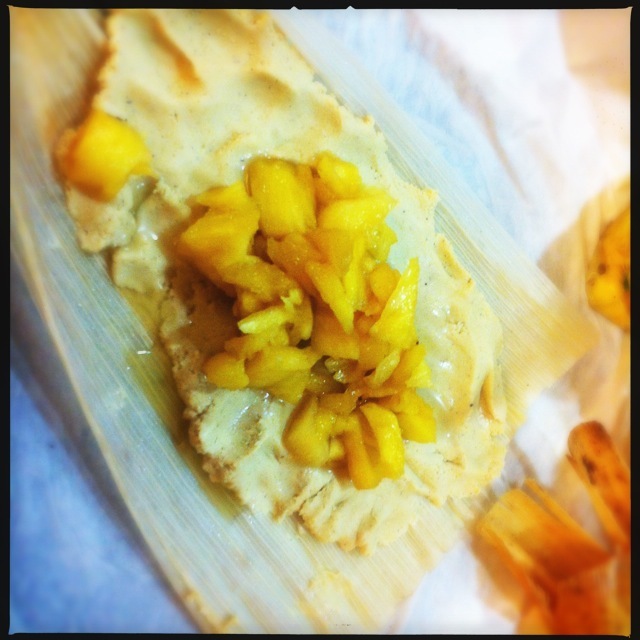 Secondly, tamales are way too labor-intensive to make in small batches and by yourself. They’re not technically difficult to make, they just take FOREVER. 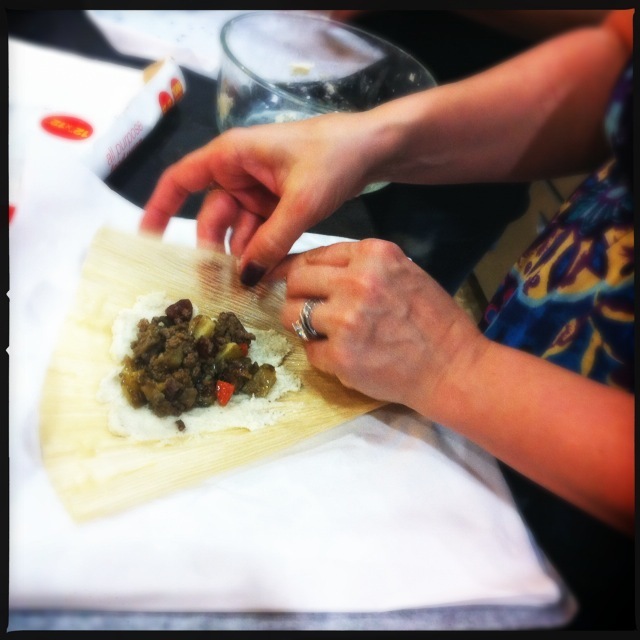 If you make your own filling, and you make your own masa, it can take several hours of active work. I am all for slow-cooking — in fact, I love slow-smoking meats and slow-simmering chilis and stews — but those kind of recipes take maybe 15-30 minutes of actual work, and then the other 5-6 hours of work are being done by the slow cooker or smoker. The plan was for all of us to show up with pre-made fillings (we all brought different types, more on that later), plus masa, lard, corn husks and some munchies and drinks to share. From there, we’d make masa, fill the husks, and enjoy each other’s company over a few drinks while we stood around stuffing and rolling for a few hours. It’s a great way to make a ton of food of any type, but especially something as simple as tamales. Step 1: Prepare fillings and masa dough. Pre-soak husks. 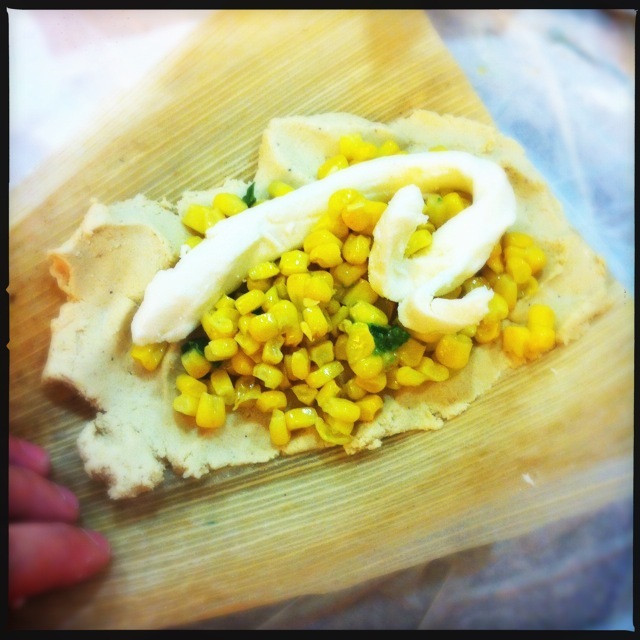 Step 2: Spread masa on clean, dry corn husk. Step 3: Spread filling on masa dough. Step 5: Steam tamales for 45 minutes to one hour over boiling water. 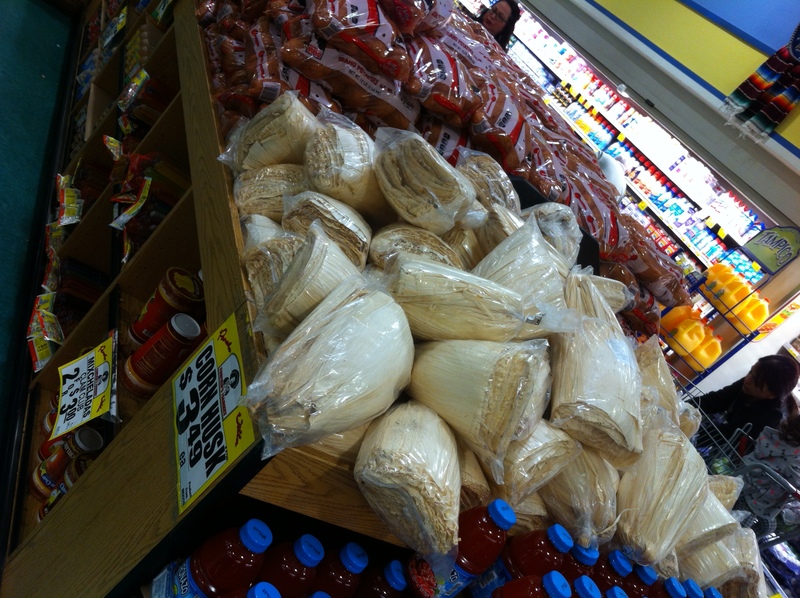 … and an amazing selection of husks. I guess ’tis the season. 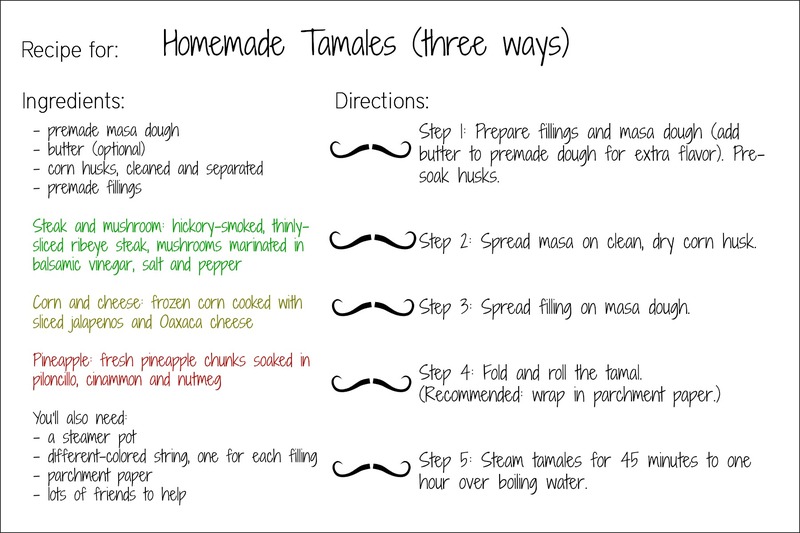 So it’s not hard, but it’s time-consuming … However, making tamales doesn’t have to be a tedious process. 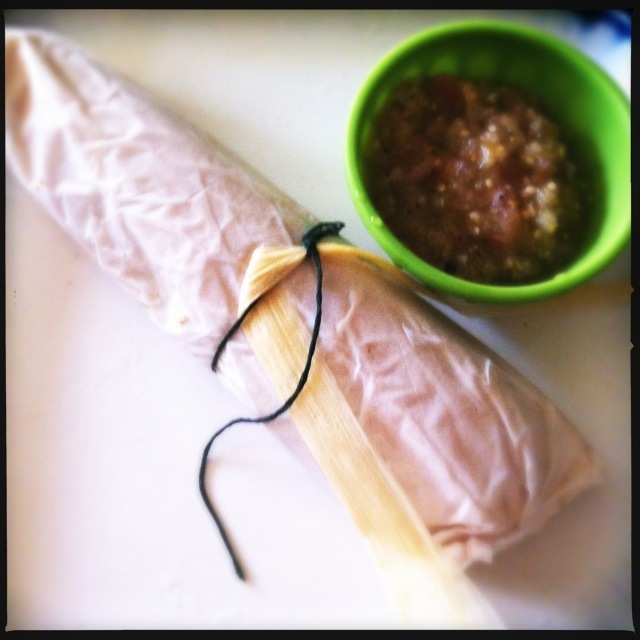 Here are a few things I would recommend to make lots of tamales without such a headache. 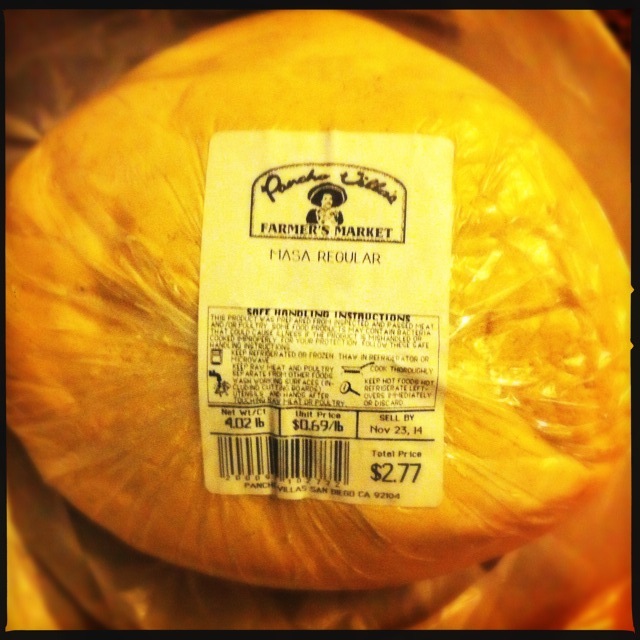 Premade dough: To save time — seriously, saving like half of the time — we used the premade masa dough, but here is a good and simple recipe if you can’t find premade dough, or you just really want to make the dough from scratch. If you buy it premade, I’d recommend adding some good butter to it to make it creamier, tastier, and easier to spread. 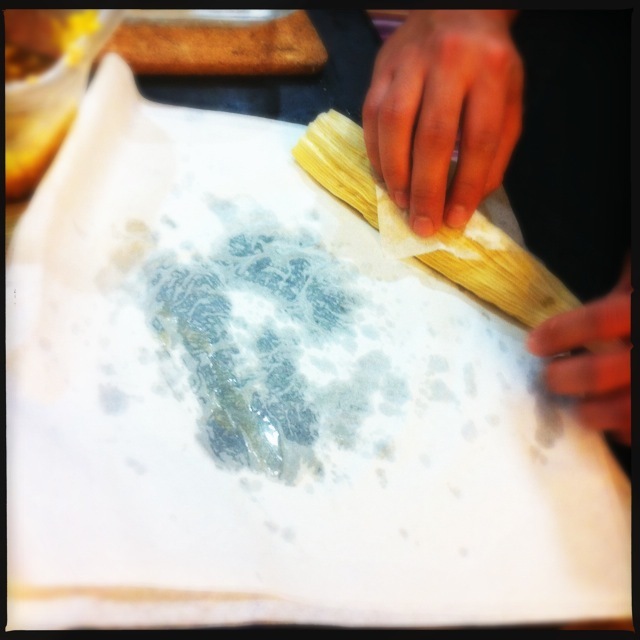 Parchment paper, preferably pre-cut: especially if you’re a beginner and you have husks of various sizes, it’s very hard to make uniformly sized and shaped tamales. To keep the fillings intact and the cleanup easy, every time you wrap a tamale, wrap it in a sheet of sandwich paper or parchment. You can steam them in the paper, too. Colored string: eventually you will forget which filling went into which pile of tamales. Tie them with different-colored strings (embroidery thread works great) to indicate which filling you used. 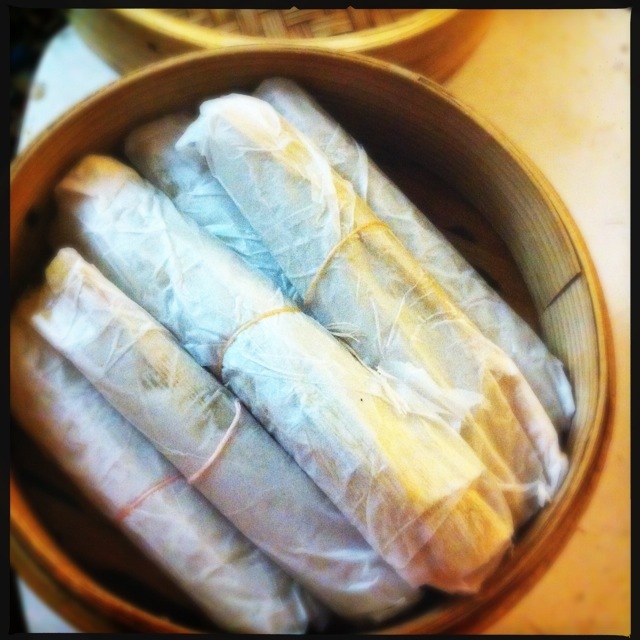 Freeze them uncooked: tamales aren’t done until they’ve been steamed for 45 minutes to an hour. But if you’re making lots of them at a time, you can wrap them individually in parchment and freeze them in plastic bags, then steam them after defrosting. They’ll keep for months uncooked in the freezer. Kitchen assistants: have lots. You’ll need all the hands you can get to help soak, rinse, dry and separate husks, to make sure the masa is mixed and tasty, to cut threads, spread fillings, pour wine, roll tamales, everything. Get the kids. Get the neighbors. Everyone can have a job to do. Prep work: do as much as you can ahead of time. Pre-soak your husks for at least an hour, make your masa if you’re not buying it, and make your fillings the day or night before so they will be cooled and easy to use when you’re ready to spread them on the masa. I made four different fillings: a simple corn and cheese filling, a sweet pineapple filling, a smoked ribeye and mushroom filling (my ode to the classic British steak and mushroom pie), and roast duck and kale. 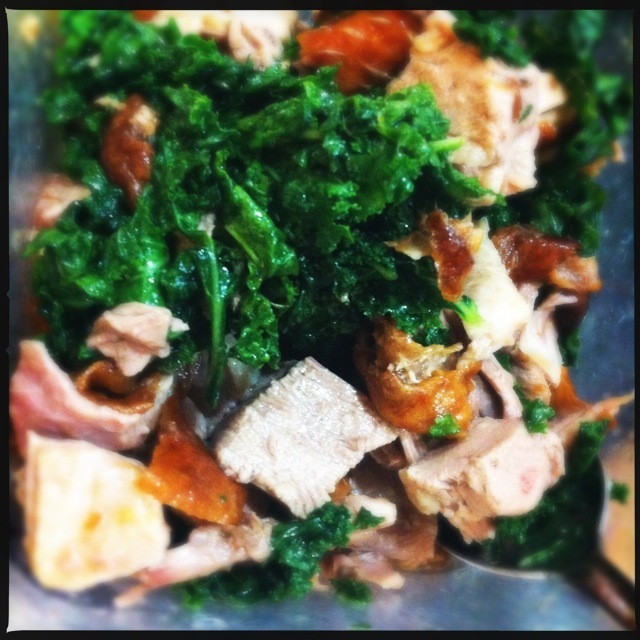 The last one was the simplest: I chopped some kale and marinated it — or, rather, stuck it in a freezer bag with fish sauce and black pepper on the way to the tamale party, then picked up a roast duck from my favorite dim sum restaurant and added the fatty, crispy duck to the salty kale. 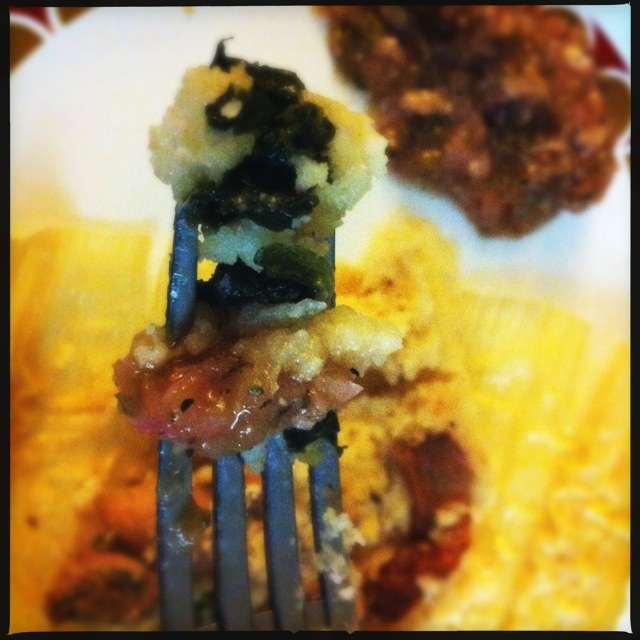 The duck and kale tamales were delicious with homemade tomatillo salsa. 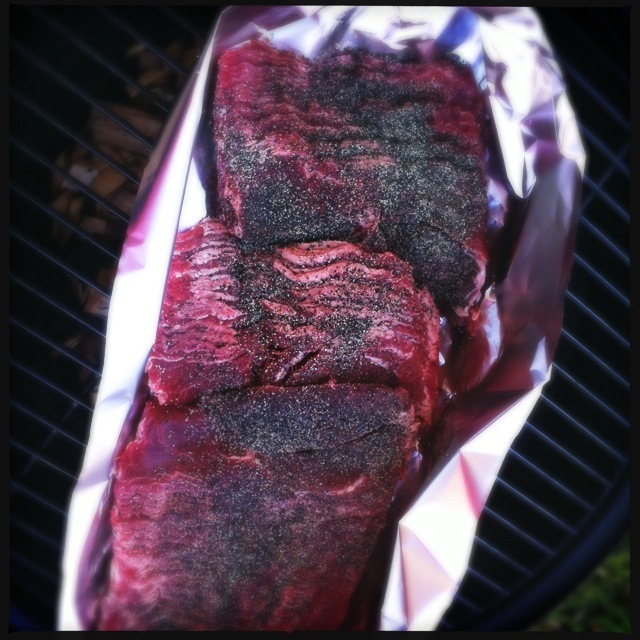 A few hours before the party, I seasoned some thinly sliced ribeye steaks and smoked them over hickory wood chips. I also marinated some mushrooms (again with the baggie) in some balsamic vinegar. 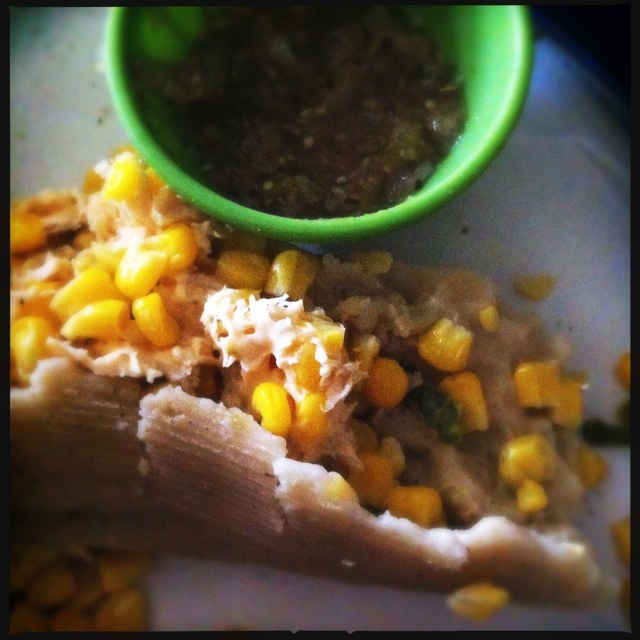 I wanted to copy a steak and mushroom meat pie, and I think this finished tamale was my favorite. Season the steaks with pepper and place on a piece of foil with a small amount of oil. Smoke over soaked wood chips for at least one hour at 350 degrees. Chop the mushrooms very finely and place in a freezer bag with balsamic vinegar and a few teaspoons of pepper. Once the steak is smoked, chop the meat finely and blend with the mushrooms (don’t forget the meat juices inside the foil). Place the diced pineapple in a large bowl with vanilla bean and spices. Place the cone of piloncillo in a small nonreactive pot with 2 cups of water (enough to cover the cone) and bring to a boil. Simmer until the piloncillo is dissolved. Pour over the spiced pineapple mixture and let sit at room temperature for at least one hour. Drain liquid before adding to tamales. Put the corn, jalapenos, butter and spices in a large pot over high heat until the butter is fully melted, the jalapenos are cooked and the corn is starting to char. Season well (and taste to make sure). 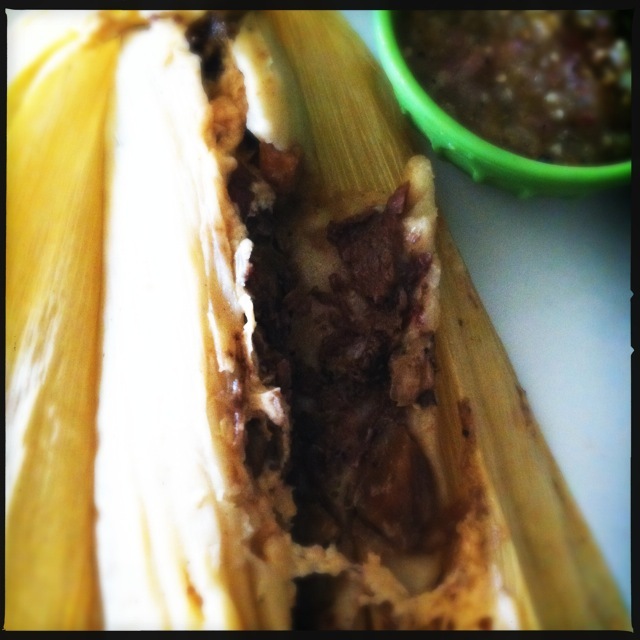 Add a hunk of Oaxaca (or thick, mild melty, cheese) while assembling your tamales. Of course, you can’t properly enjoy tamales and good Mexican food without good salsas and hot sauces. 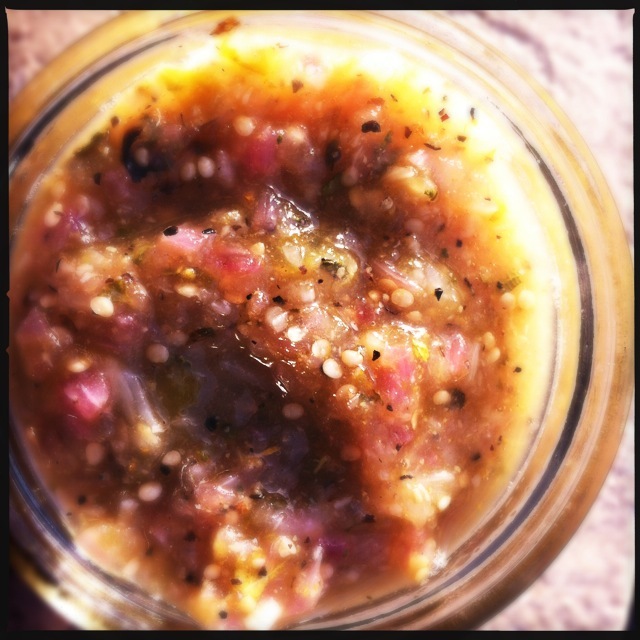 In addition to my homemade sriracha and curtido, I also make a mean tomatillo salsa. If you like it can be totally mild, or with an added kick of jalapeno. This recipe is a variation on one of my faves, this tomatillo salsa and crockpot carnitas recipe from 100 Days of Real Food. Mine is totally similar except I use red onion instead of white (just a personal preference), I add garlic, too, and I roast my veggies first. Roast the tomatillos, onions and garlic uncovered, except for the garlic (put that on some foil and drizzle them with olive oil), on your grill or roaster. 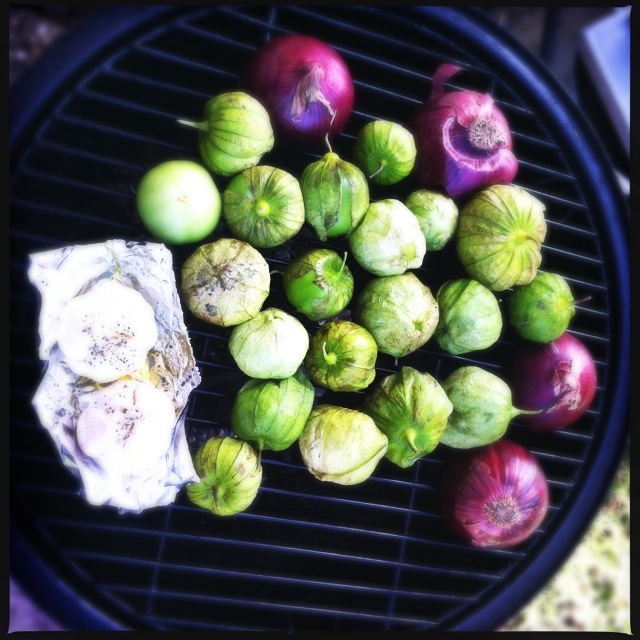 They need to char slightly over high heat until the tomatillos are soft. Let cool completely, for at least 20 minutes after removal from heat. 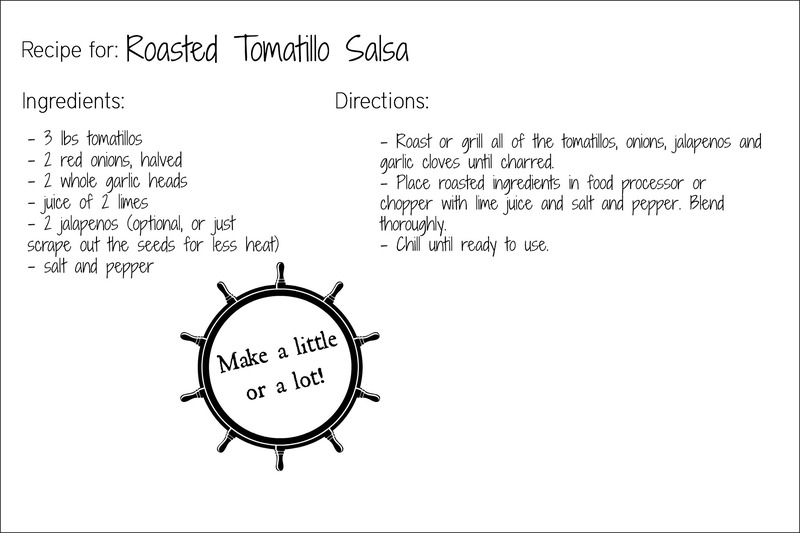 Peel, chop, and mix together the tomatillos, onions and garlic, then season well with salt and pepper and add lime juice. If the mixture is too chunky, place into a food processor or chopper and puree until smooth. 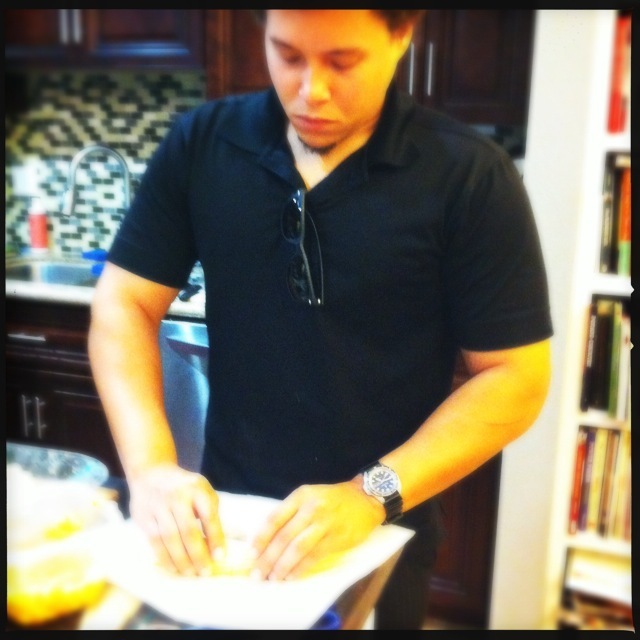 This entry was posted in Uncategorized and tagged cheesy corn tamales, hickory smoked ribeye and mushroom tamales, how to make tamales, masa flour, pineapple tamales, roast duck and kale tamales, roasted tomatillo salsa, spicy tomatillo salsa, steak and mushroom tamales, tamale, tamale party, tamales, tepache, tomatillo salsa. Bookmark the permalink. This was such a good time! So glad I got to share this with you. This was such a great party! So glad I got to share it with you.